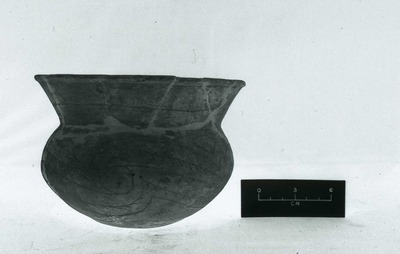 "41HS3, 742, Burial A-57" by Timothy K. Perttula and Robert Z. Selden Jr.
DECORATION (INCLUDING MOTIF AND ELEMENTS WHEN APPARENT): The rim is decorated with two horizontal engraved lines. The vessel body has four sets of engraved scrolls and circles; the circles have an inner excised circle. Above and below the scrolls and circles are curvilinear engraved zones with tick marks, and triangular zones with one excised corner. Ripley Engraved, cf. var. Galt jar (No. 742) in Burial A-57 at the H. R. Taylor site.